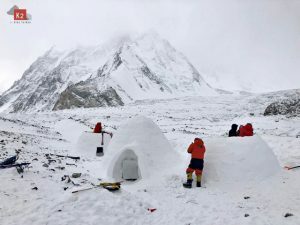 The base camp at K 2, the second highest mountain on earth, will turn empty in the coming days. 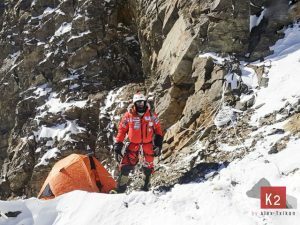 Andrzej Bargiel and his Polish friends declared that their ski expedition was over after they had finished their summit attempt at the weekend because of too much avalanche danger. The Swedish Fredrik Sträng and his Pakistani companion also turned around. 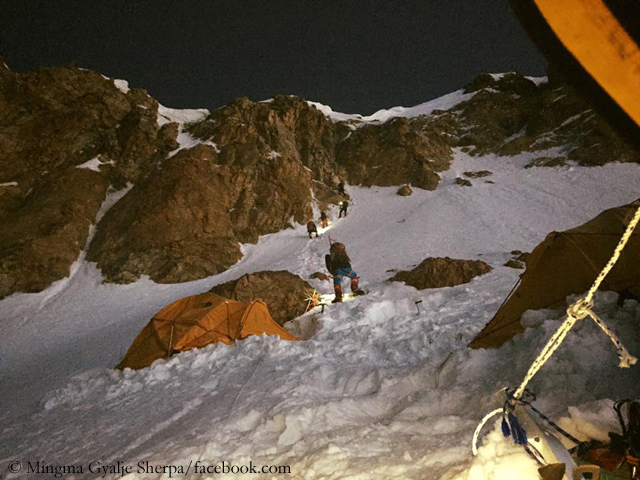 The commercial expedition operators Furtenbach Adventure and Himalayan Experience had previously thrown in the towel. Mingma, first of all congrats to you and your team. Great performance! Some expedition leaders turned around due to the avalanche risk which they valued as being too high. What made you feel confident that it could work? A key part of our success was our good weather report. The weather remained very windy when we were in Camp 2 and 3. I was sure that all the fresh snow would be blown away by the wind what made us feel that there won’t be any avalanche. The best thing about our team was unity. My team listened to whatever I said and worked perfectly together, so we were successful. How were the conditions on the summit day? I think, the summit day of K2 is the hardest one among all 8000m peaks. The route to the summit is more on ice. These icy parts are covered by very thick snow which increases the risk of avalanche. We had to be very careful while breaking the trail. I found this year was more ice and it was really difficult to get to the summit ridge. However, the threat of avalanche was less high since most of the days were windy and snow was well frozen. I assume there was a lot of trail-breaking to do because of the great amount of fresh snow. Who did this hard job? Some carried rope, some belayed and some broke the trail. This was team work. We had to fix more ropes on those snow covered ice passages. 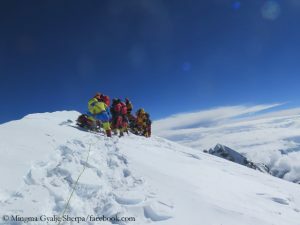 Was there anyone among the twelve summiters who was climbing without bottled oxygen? Sorry, this time I used oxygen, otherwise it would not have been possible to reach the summit. 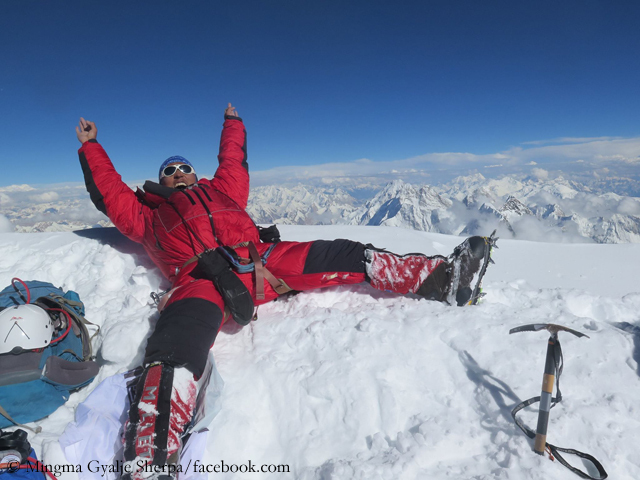 But Nima Nuru Sherpa from Thame in Nepal and Fazal from Pakistan made it without bottled oxygen. You had a very strong Sherpa team at your side – with in total about 50 Everest summit successes under their belts. Was this the key to K2? On the one part yes, but on the other part no. Our Sherpa team was strong and well experienced but Everest and K2 are located in different countries so climbing culture is different. 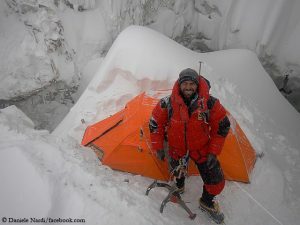 Working on K2 is more difficult than on Everest because of far less teams on K2 and unpredictable weather conditions. In my last blog post I called you the “8000er Climber of the Season” because of your achievements this year. Is their any time you get tired? 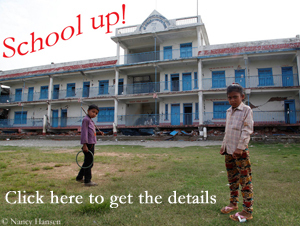 What’s your secret of success? Thanks for your compliment. I am only getting tired of sleeping in tent everyday. But I do like climbing by myself so I am not getting tired. And this is the reason I am successful.